Taylor Shelton and I recently convened an article forum on Geography and ‘Big Data’ in Dialogues in Human Geography. Our lead article, “Geography and the future of big data, big data and the future of geography” (pre-pub version here) points to some of the potentials of 'big data’ in geography and some of the potentials of geography in 'big data.’ But it also argues that we need to remain cautions of the ways that 'big data’ can obscure, rather than reveal, the complexity of social and spatial processes. We were privileged with a group of very knowledgeable and critical scholars to develop this important and timely conversation. The rest of the special issue can be accessed here, or through the links below. We’ve just published a new map over at the Information Geographies project. This one draws on some of Matt Zook’s research into the geography of domain names. The map offers a detailed overview of one-facet of the geography of content production. Some results are unsurprising (for instance the low scores in many countries that have low numbers of internet users). 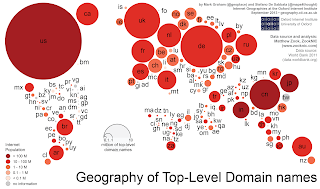 However, other unexpected patterns also reveal themselves (such as the relatively low numbers of domains in many Asian countries). For a more detailed description of results take a look at the discussion on the map’s Internet Geography home.